From IDW Publishing. 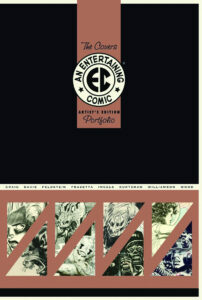 The EC Covers Artist’s Edition Portfolio is available only from IDW Publishing and features 8 classic EC Covers, each one printed on heavy stock and printed to the same exacting standards as all Artist’s Editions: Crime Suspenstories #22 by Johnny Craig; Tales from the Crypt #46 by Jack Davis; Weird Fantasy #15 by Al Feldstein; Weird Science-Fantasy #29 by Frank Frazetta; Haunt of Fear #20 by Graham Ingels; Two-Fisted Tales #25 by Harvey Kurtzman; Weird Fantasy #21 by Al Williamson and Frank Frazetta; and Incredible Science Fiction #33 by Wally Wood. This is an odd collection of material that doesn’t fit any IDW template of Artist’s Edition material. 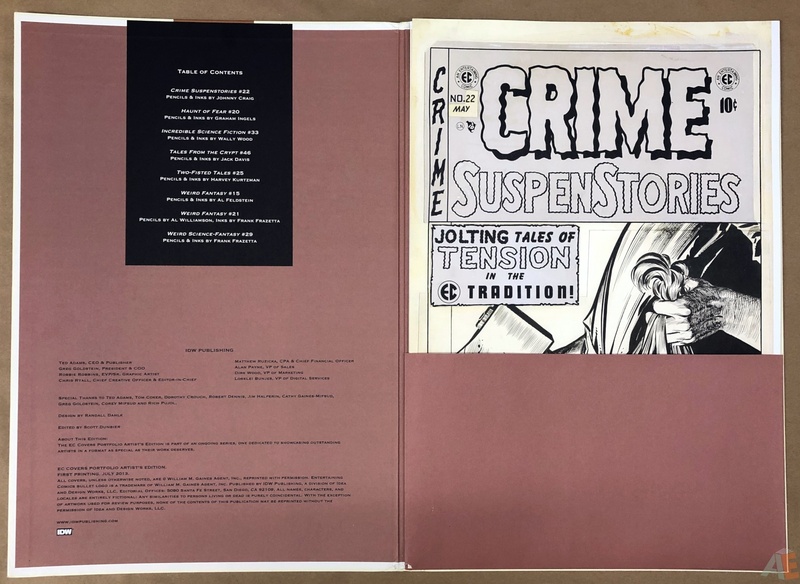 All other portfolios published were material not appearing in an Artist’s Edition, yet this portfolio includes material that appeared in various Artist’s Editions, before and after. 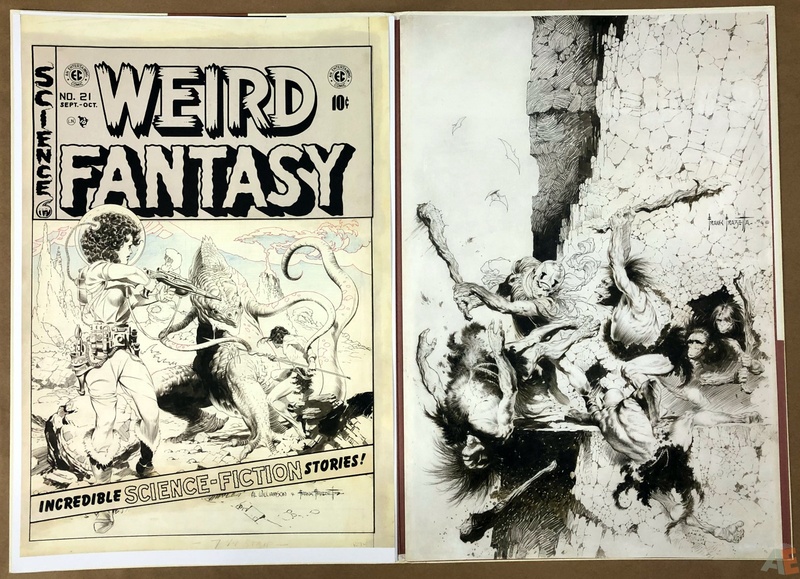 In Best Of EC: Artist’s Edition, Volume One: Crime Suspenstories #22 by Johnny Craig, Weird Fantasy #15 by Al Feldstein, Weird Science-Fantasy #29 by Frank Frazetta. 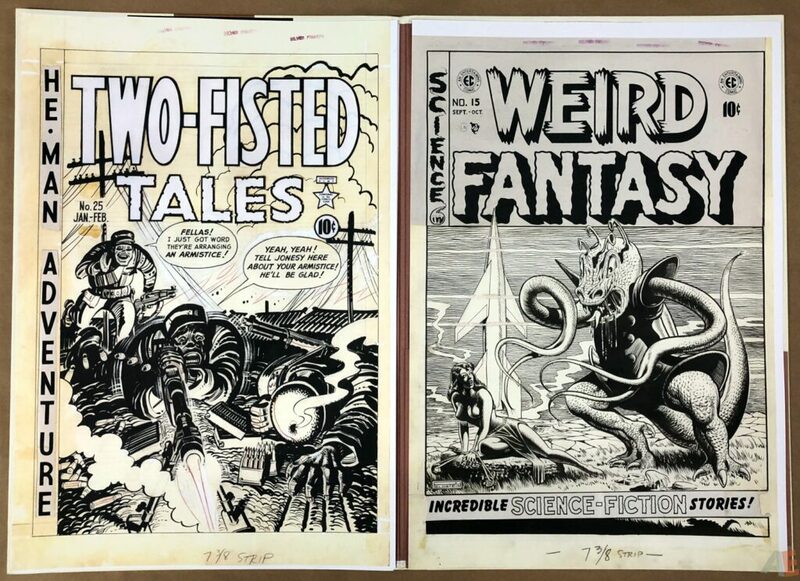 In Best Of EC: Artist’s Edition, Volume Two: Weird Fantasy #21 by Al Williamson and Frank Frazetta, Two-Fisted Tales #25 by Harvey Kurtzman. 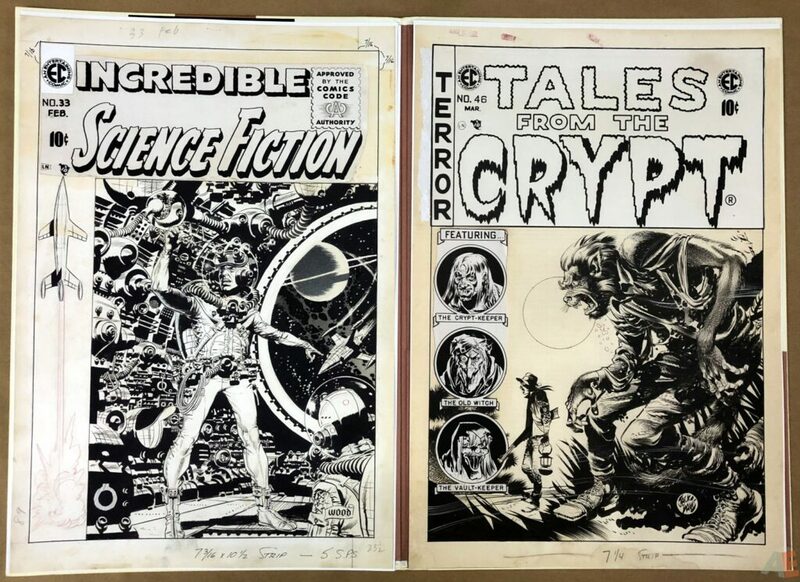 In Wally Wood’s EC Stories: Artist’s Edition: Incredible Science Fiction #33 by Wally Wood. 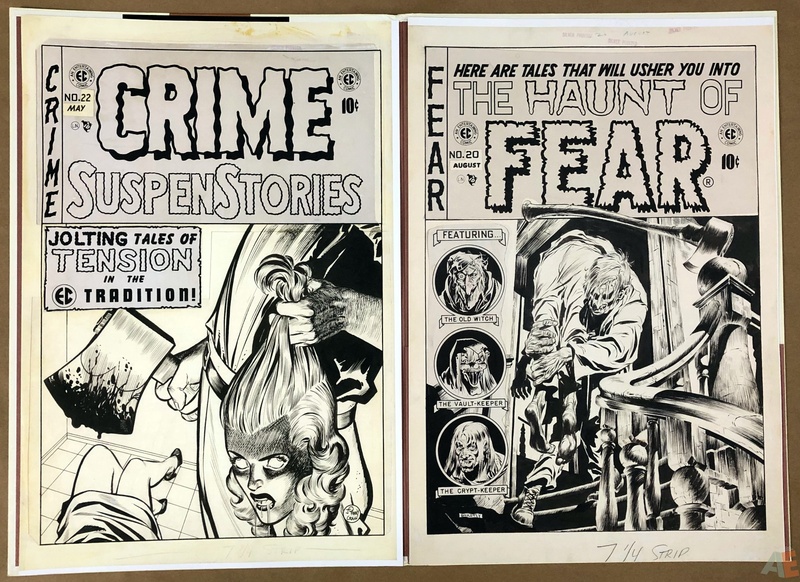 In Graham Ingels’ EC Stories Artist’s Edition: Haunt of Fear #20 by Graham Ingels. In Jack Davis’ EC Stories Artist’s Edition: Tales from the Crypt #46 by Jack Davis. Three of these were published before this portfolio, and three followed it. Plus, six of these eight images have been used as covers for Artist’s Editions. 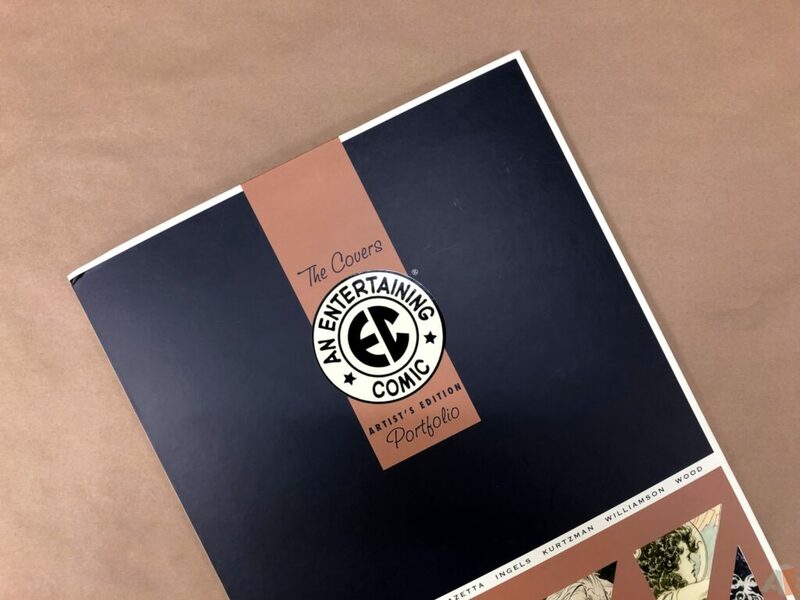 As well the colophon lists this work as EC Covers Portfolio Artist’s Edition, yet the cover states EC The Covers Artist’s Edition Portfolio. The back of each plate states “THIS IS NOT ORIGINAL ART”. Always appreciated. As is the Table Of Contents on the left side, allowing you to see the contents in print and peruse the plates. Dahlk’s design plays off what he used for Best Of EC: Artist’s Edition, Volume One, or at least the colours. The design is a complete departure from the rest of the IDW Artist’s Edition Portfolio line, but works wonderfully as a companion piece the Best Of EC books. The usual IDW portfolio production, very heavy paper stock plates in a cardboard portfolio. It comes in a mylar sleeve with the UPC on a sticker sealing the sleeve. I had trouble locating information for this product. The Previewsworld listing came up, with Diamond code OCT138171, as did the SDCC 2013 listing. But nothing for a retail release from IDW, or in the October 2013 solicitations. The listed retail price is based on SDCC 2013 pricing. Like most of these portfolios I purchased mine second hand at a comic shop. The top corners were bent but I only paid $30 Canadian and with some applied pressure got the corners to a fairly good place.